The dog: man’s best friend and loyal companion. The dog: our best friend and loyal companion. Through thick and thin, good and bad you know your fur baby will always greet you with a big slobbering kiss. 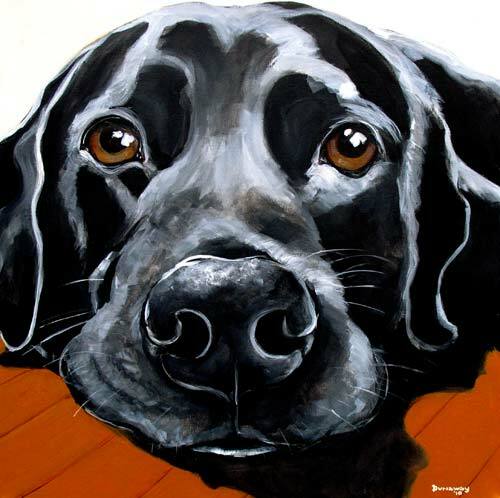 Whether your fur baby is still here with us or in doggy heaven, what better way to remember him or her than with a painting hanging proudly on your wall? 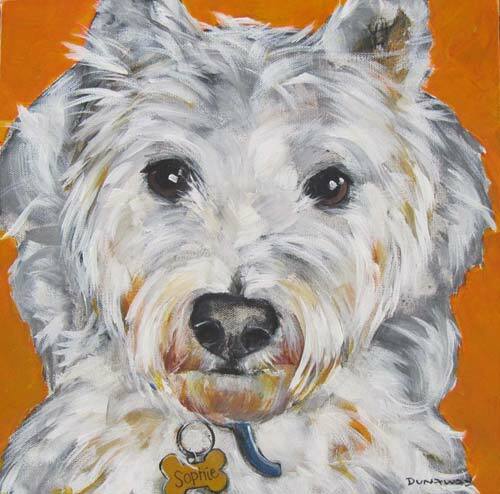 Commissioning your pet’s portrait is easy! I work from your photos and description of your pet’s unique personality. As you can see from my work, I tend to keep backgrounds simple so as to keep the focus on the animal but am happy to discuss anything you have in mind! Once the size, photo and any other details are decided and a 50% deposit is paid, your order is officially placed! The remaining amount is due when the portrait is completed. I will email progress pictures of the portrait along the way for approval at each step. The prices do not include shipping or sales tax (for GA clients only). The prices are set for one animal on the canvas; if you would like additional animals please add 25% per animal due to additional time involved. 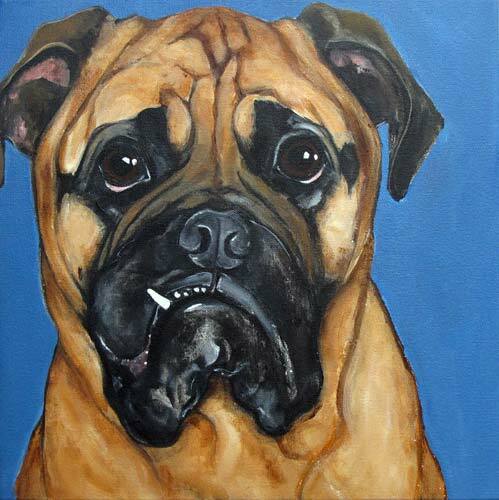 Each canvas is painted on a “gallery style” canvas with sides just under 1.5 inches thick. The canvas sides are painted and finished with the client’s choice of either the continued image or a solid color wrapping around the edges. The canvases look fabulous without a frame but are thin enough to lend themselves to many framing options as well. If you prefer the “wood” look rather than the canvas look, crated wood panels with stained sides are available at a small additional charge. The better the photo, the better the painting! Ensure that your photos are clear with as good of lighting as possible (natural light is best!). Often “eye level” photos of animals work really well! Although I will work primarily from one photo, it does help me to have several photos of your fur baby for reference. 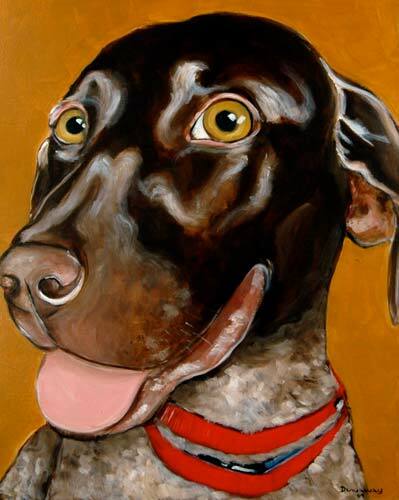 As much as I would love to paint Fido all day everyday, I am a mom of two amazing humans and two incredible fur babies. I also teach 800-ish precious little artists and teach a few Zumba classes. I will always be realistic with an estimated completion time frame. At present, I am only taking on about 3 commissions per year. I hope to be able to take on more commissions once again in the next few years. If you have a date you absolutely need it by then please do not hesitate to let me know; if I can complete your portrait by your special date without jeopardizing quality or other customer’s orders then I will. I love animal rescue. Both of my doggies are rescues and I cannot imagine life without them. It is humbling to think that without us, Tacoma and Aspen likely would not have had a second chance at life and love. 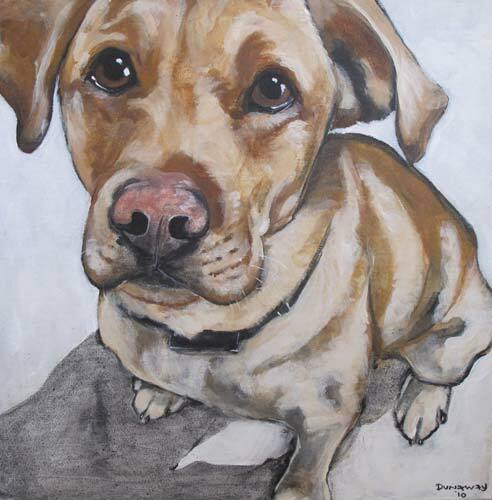 I donate a portion of each commission to rescue groups / animal shelters. Mostly Mutts, Hopeful Hearts, Friends of Shelter Animals of both Cobb and Gwinnett Counties, Eagle’s Den, Angels Among Us and Dixie Dog Rescue are some of my favorites. If you have a favorite rescue to which you would like for me to donate for your commission, please let me know! The majority of my clients have me use a traditional canvas when doing a commission for them. Another option that is becoming more and more popular is the use of a crated wood panel. They have a more refined look without the need for a frame and the side of the wood panel can be stained to your liking. If you still want to with the classic canvas, I use high quality gallery wrapped canvas that is back stapled for a nice, clean look. The edges can be finished with a solid color or the image can be wrapped around the sides (works best with the thick sized canvases) for a unique look. I request a 50% down payment with every commission. The final 50% is due upon completion and when the client is 100% happy. I love emailing progress pictures as I work on the painting as it keeps the client involved and ensures that I am on the right track. Photos are extremely important and the quality of the photos is paramount (grainy photos from a distance or photos where a grey dog looks blue are not ideal). I like working from several photos even if I am primarily basing the portrait off of the composition of one photo. I get a better feel for the animal for coloring, lighting and personality from several pictures. I LOVE hearing about the animal’s personality! On top of being entertaining, I feel the description is essential to capturing a personality. If a client has several animals and wants all of the animals on the same canvas I am thrilled to paint all of them (and always have fun getting all of those animals in there together) but a small percentage is added due to the extra time involved in painting the details of the extra animals. I usually give myself several months to complete a commission but if you have a time constraint or request please do not hesitate to contact me and if it’s possible to work it in I am happy to do so.